Is This What Our Country Needs To Stop Flooding? WATCH: Is This What Our Country Needs To Stop Flooding? Man, that's one thirsty concrete. Stranded commuters, stalled cars, submerged houses, and lives put in danger—you know how it is after a heavy downpour in Manila. Flooding's a huge problem, and one that authorities say will take years to solve. They point to different causes: deforestation, global warming, clogged drains. But construction company, Tarmac Inc., may have the solution. 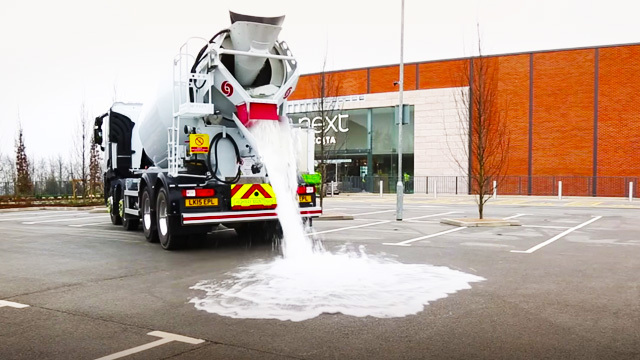 They've created what they classify as "Topmix Permeable," an absorbent concrete designed to soak up nearly 900 gallons of water in just 60 seconds. This could help prevent flooded roads, especially during this rainy season. "The concrete has a permeable layer on top that permits water to quickly drain through to another quick draining layer of pebbles and a base of rubble below," the developers explained. "Within the rubble, drainage channels increase the amount of water directed away from the surface and back into the earth, thus helping to recharge groundwater resources." This could also prove useful even in the summer, when it's literally hot as hell. "During periods of rising temperatures and intense rainfall, water stored within the system evaporates creating a cooling effect reducing surface temperatures," Tarmac said in a statement. So how about this, presidential hopefuls: first one to adopt this innovation to the country gets our vote!